“MY name is Bert Middleton. I’m the second oldest man in Britain. Old Bert (David Ryall) talks to a modern day TV documentary crew in the opening moments of new BBC1 drama serial The Village. Before we go back to the summer of 1914. 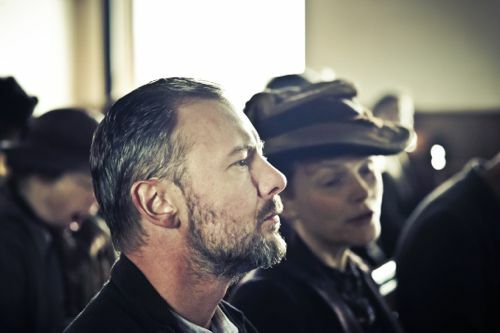 John Simm and Maxine Peake play farmer John Middleton and his wife Grace. With Nico Mirallegro as their eldest son Joe, aged 19, and Bill Jones as youngest son Bert, aged 12, the old man we met earlier. The first episode was screened at BAFTA in London earlier this month, followed by a Q&A with Peter (who is also executive producer) plus cast members Nico Mirallegro, Juliet Stevenson (Lady Clem) and Rupert Evans (Edmund). My full transcript of that Q&A with some fascinating quotes – not least from Peter – is further down the page. Including his mention of “The Wrong Ducks in Lark Rise Syndrome”. As you will read, Peter’s grand plan, given the chance, is to write a total of 42 episodes telling the entire 100-year history of the unnamed northern village. With the camera never leaving the village and the countryside around. The Village – at least initially – may feel to some like a BBC2 drama, rather than BBC1. With a slow burn approach that could lose a section of viewers across the first 30 minutes or so. But I’d urge them to stick with it for the later rewards which will be all the greater for the time and faith invested. 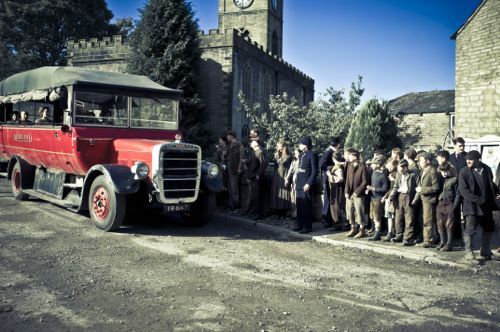 The Village has the potential to be remembered in decades to come as a classic television drama achievement. So I hope those involved in an eventual decision about a second series look at the longer term wider picture of what he is trying to do. The first series covers the period between 1914 and 1920. There are some remarkable ensemble cast performances. 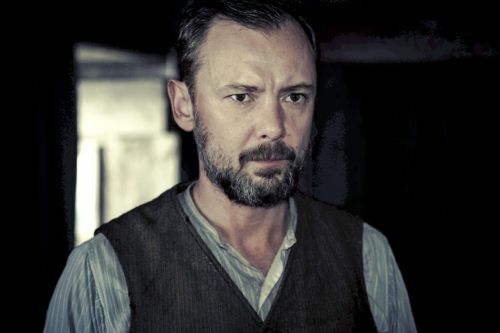 When we first meet John Simm’s John Middleton he is a frustrated, violent and repressed alcoholic, riven with guilt about something that happened 20 years before. “Must a man pay all his life for one mistake? he asks. 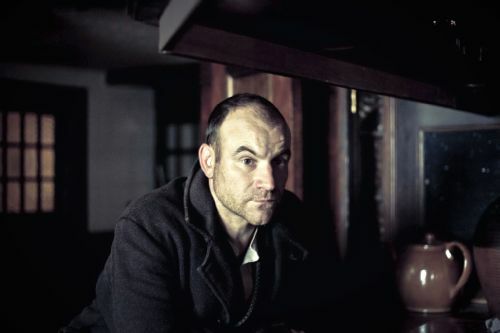 Who thinks nothing of locking young Bert in a cupboard. 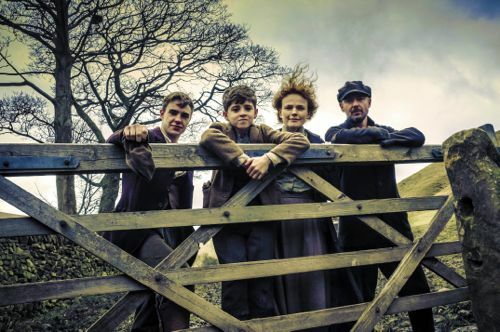 Maxine Peake’s Grace is the woman in the middle, struggling to feed and protect her two sons as the family farm hits hard times. Some have tried to paint The Village in terms of a “gritty” anti-Downton Abbey view of history. There’s a manor house where Lady Clem (Juliet Stevenson) and her rather mysterious family live – including Rupert Evans as local MP Edmund Allingham. Together with a rather unhinged young woman called Caro, played by Emily Beecham. The story I wrote a few hours after the BAFTA event is below. Followed by that full Q&A. 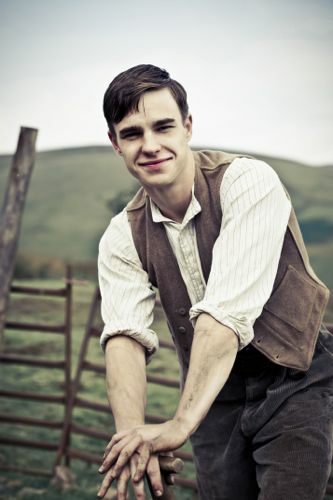 THE Village star Nico Mirallegro was left speechless during filming after plunging naked into a freezing cold lake. Former Upstairs Downstairs, Hollyoaks and My Mad Fat Diary actor Nico plays Joe Middleton in the epic BBC1 period drama series. “I’m still traumatised from that scene in the lake,” he revealed. Joe goes into the water to teach his younger brother Bert (Bill Jones) how to swim. Then vanishes as he pretends to be pulled under the water. “We just went for it – but I realised that I couldn’t say the line in the lake. It was physically actually shock in your body. But Nico was shivering so much that he later had to re-record his lake lines in a studio to be dubbed on to the final version of the drama. 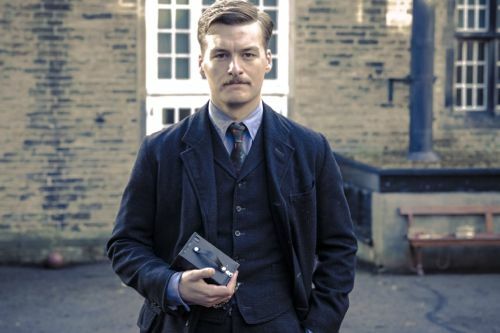 The six-part series, on screen later this month, starts in 1914 and aims eventually to tell the story of one English village across the whole of the 20th century. Joe is the eldest son of John and Grace, played by John Simm and Maxine Peake, growing up in extreme poverty on a family farm. He also works as a servant at the nearby “Big House” and is seduced by that family’s young daughter Caro (Emily Beecham) in the woods. While his naked adventure in the lake is witnessed by another young female admirer – teacher and local Methodist missionary Martha, played by Misfits actress Charlie Murphy. 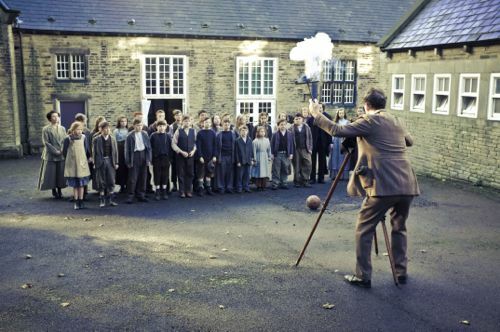 Filmed in Derbyshire’s Peak District, the camera never leaves the village and tells the history of the century through the residents’ eyes. Q: Peter – do you want to take us through the genesis of the idea for this series? 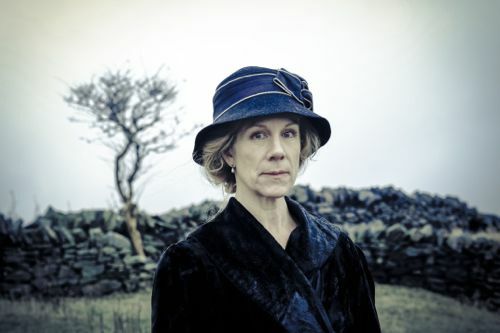 Juliet Stevenson as Lady Clem. Q: Juliet – what attracted you to this project? Q: What was it like to film up in the Peak District? 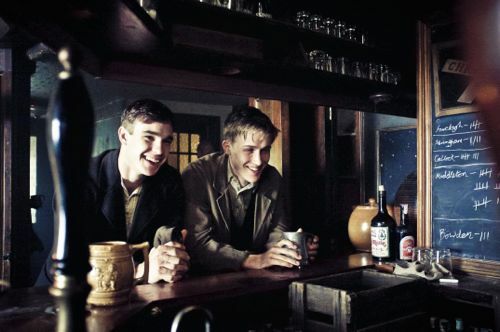 Joe (Nico Mirallegro) and Paul (Luke Williams). 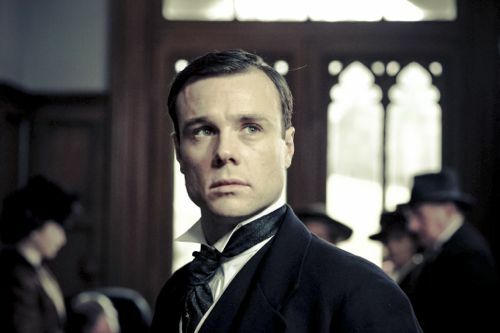 Rupert Evans as Edmund Allingham. Q: Rupert – we didn’t see a lot of your character in the first episode. What’s coming up for your character, how is he going to develop? Q: What was the scope…we’ve already heard talk about going right through the 20th century. That is ambitious. How do you plan for a series that is going to last almost in perpetuity? Peter Moffat: “An episode I’m reading now, which is getting ahead of myself – there may never be a second series. Who knows? But you have to do it. Research is everything. The great luxury of the first series is that I had about three years of working on it before writing. And the first episode took me six months to write. An American television writer said to me once, ‘Are you writing a play?’ I said, ‘Yes.’ He said, ‘How long does it take you, do you think, to write a play?’ And I said, ‘Nine months.’ And he said, ‘Nine months?’ And I’ve got no idea what he means. Whether that’s way too long…and actually, of course, with television, both is true. A lovely nine months to write a first episode and then, ‘Can we have episode six in three-and-a-half weeks?’ So different demands and interesting demands. Often, weirdly, how annoying is this? – the three-and-a-half week thing is a bit better…” (laughter). Q: Why start it in 1914? Q: Being cast back 100 years. What aspects surprised you? Q: Juliet – can you say a bit about where it was filmed? Where the big house was? 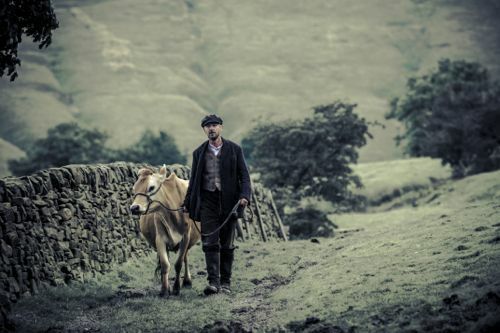 Q: Was the choice of Derbyshire influenced by the fact that there is a particularly strong agrarian and mills and chimneys, as they refer to it, oral tradition existing side by side in Derbyshire? Emily Beecham as Caro Allingham. Q: Peter – to what extent were you on set and how much was the dialogue / text revised as you were filming? Q: Is there any even tacit political undercurrent to this? Are there any points you are trying to make? Q: What is it like for actors when you have your writer, also as exec producer, hanging around on set and looking over you? Is it useful? Q: (From me as it happens) As you’ve said, you can’t know yet whether you’ll get a second series, let alone a third or a fourth. But presumably you’ve mapped out the journey to the end of the century? What would come next in a second series after 1914 to 1920? Q: That must be overwhelming. That’s just so much history? Q: There’s a beautiful painting of Judi Dench in the National Gallery. It’s stunning. I think you’ve all crafted a really magnificent piece on the acting and writing. Even the light and colour. When you came to the end of the series, did you have a sense of loss of that era, of anything that we, as a nation, have left behind? 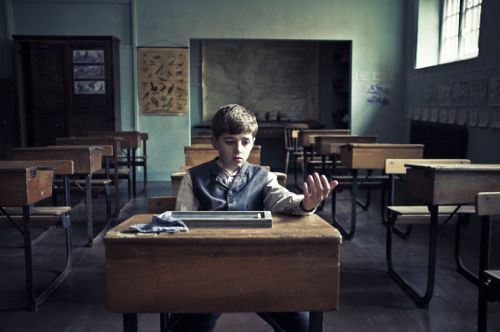 Matt Stoke as teacher Gerard Eyre. Q: The suffragette (Martha) coming through – will that progress? And your (Juliet’s character Clem’s) husband, the man who was covered, facially distorted…are you going to delve into some of the characters about why they are who are they are? 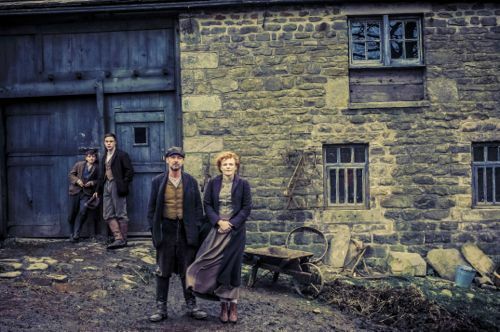 The Village begins on BBC1 at 9pm on Sunday March 31. Bill Jones as Young Bert. Posted in News and tagged BBC Drama, BBC1, Bill Jones, Charlie Murphy, David Ryall, Emily Beecham, John Simm, Juliet Stevenson, Maxine Peake, Nico Mirallegro, Peter Moffat, Rupert Evans, The Village. Bookmark the permalink. Thank you – I’ve been hoping that you would transcribe the Q & A – too much to remember! (I was there) It would be a real shame if this doesn’t get a second, third, etc. series because it’s quite unlike anything that has ever been on before in it’s scope – really inventive and such an important period in our history. The changes that someone like Bert Middleton must have seen over his lifetime are amazing to comprehend; I don’t think anything like it will ever happen again, so a drama charting this unique period in our social history is long overdue. Well done to Peter Moffat for writing it! I watched episode one yesterday evening and thoroughly enjoyed it. The acting was superb all round. Looking forward to the rest, especially as the war begins. The overwhelming majority of dramas – obviously – portray the trenches, gas attacks, trench foot and so on. I’m intrigued to see Mr Moffat’s take on the impact of the war on people who only ever heard about it vicariously. Can you please tell me what the song was called that Caro sung in episode 3 at the wedding and who it is by please? As my late sister-in-law use to sing it to my husband and it brought tears to his eyes and I would like to try and get it for him. Thankyou. I hope you are able to find a sung version you and your husband will like. It’s called the ‘unquiet grave’. I watched Series 1, Episode 3 last night and was moved beyond words by Emily Beecham’s solo of what I guess is the song called “Unquiet grave”. I’ve been looking for this song all morning and would like to learn it myself. Thanks. what a fantastic series. it may have been a slow burn but I was hooked after that first episode. while I am not an historian I love to read about both world wars and the middle ages but I do know how accurate it was to real honest, gritty life in its many variations. Can’t wait for the next series and I hope its coming soon. Does anyone know if there will ever be another series? It was such an ambitious project, it would be a real shame if two series is all we ever get…! Have seen no sign, as yet, of a third series, Elaine. Most assume it’s not coming back but we’ll obviously see.